As soon as the weather begins to show a hint of autumn crispness, the pumpkin recipes come out in droves. 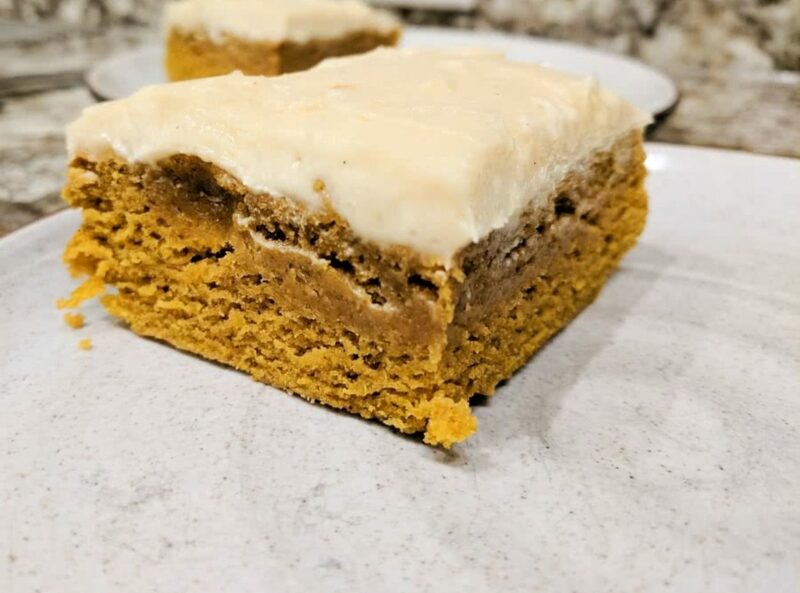 This was a surprising take on the traditional pumpkin cake desserts that can easily be found. The texture is pleasantly chewy like a brownie, but reminiscent of a moist cake, finding a happy medium between the two. These bars are not particularly sweet on their own, so slathering them with a decadent frosting leads to a truly enjoyable dessert. Brown butter in place of melted butter. Simply melt the butter in a saucepan over medium heat for 5 minutes by swirling the pan constantly. When the butter becomes nutty smelling and changes to a golden brown color with visible particles falling to the bottom of the pan, remove from the heat and swirl for another 15 seconds. Transfer to a bowl and whisk in one standard ice cube. Allow to cool to room temperature before proceeding with the rest of the recipe as written.